The other day I wrote about the weathers effect on Q1 GDP. I had no way of knowing or quantifying how much climate change is effecting the economy in numbers as I did not know this study was underway. Here is an article I read today about the study. We need to take action and do it timely and wisely. Climate change is having a present-day, negative impact on Americans’ everyday lives and damaging the U.S. economy as extreme weather brings flooding, droughts and other disasters to every region in the country, a federal advisory committee has concluded. The congressionally mandated National Climate Assessment, produced by more than 300 experts overseen by a panel of 60 scientists, concludes that the nation has already suffered billions of dollars in damages from severe weather-related disruptions, which it says will continue to get worse. The document, considered the most comprehensive analysis of the effects of climate change on the U.S., was released by the climate advisory panel after a final vote by the authors Tuesday morning. President Barack Obama is planning to promote it in a series of events this week calling for action to combat the trend, and using the report to bring public attention to climate change-related problems. “This national climate assessment is the loudest and clearest alarm bell to date signaling the need to take urgent action,” said John Holdren, assistant to the president for science and technology, during a press call on the report. The report says it isn’t too late to implement policies to reduce the carbon emissions that cause greenhouse gases, and calls on governments at all levels to find ways to lower emissions, particularly from energy production. The report also emphasizes adaptation — the notion that society needs to find ways to prepare for and adjust to some of the changes. 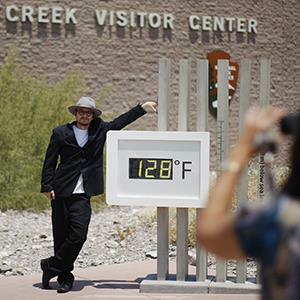 The report pins much of the increase in climate change on human behavior and resource usage patterns designed to highlight problems even at the community level. Superstorm Sandy which destroyed much of northern New Jersey’s beaches in 2012, and the heat wave in the Midwest are among examples the administration will use this week to try to raise concerns among average Americans about climate change. “Every American will find things that matter to them in this report,” said one of the lead authors, Donald Wuebbles, a professor of atmospheric science at the University of Illinois. The last climate assessment, released in 2009, said generally that climate change is affecting the country. The new report, Mr. Wuebbles said, shows how further shifts in each area could hurt sectors of the economy such as transportation or force local populations to move. The White House campaign to publicize the report will include eight television meteorologists. Americans feel “comfortable” with local weather reporters, who can discuss climate change warnings without being politicized, said an administration official. The president will do one-on-one interviews Tuesday with NBC Today Show co-anchor Al Roker and ABC Good Morning America’s Ginger Zee, as well as some regional weathercasters, said the official. Several authors said the strong warnings in the assessment weren’t presented to “scare” people, but to convey the importance of preparation and mitigation in, for example, U.S. ports. But the report will almost certainly generate pushback from conservatives, some who say that proposed mitigation measures cost business too much and will hurt the nation’s economic recovery, and others who say it exaggerates the problem altogether. Those concerned about climate changes applauded the assessment. The authors, “show the urgency of climate change issues in major cities and small towns across the country,” said Daniel J. Weiss, senior fellow at the liberal-leaning Center for American Progress. He said the report is too specific about effects such as droughts, eroding shore lines and flooding to be ignored. The national climate assessment was mandated by Congress in 1990 as a quadrennial review. Environmental issues haven’t been among recent administrations’ hottest issues. There have only been two other reports, in 2000 and in 2009. It doesn’t offer specific remedies because of its limited scope but does suggest a need for urgency. The report bolsters tough air and water pollution limits promoted by Mr. Obama, administration officials said. Its release could help buffer backlash from new regulations restricting carbon emissions from the U.S. existing coal-fired power plants, due to be unveiled the beginning of June. Dr. Jerry Melillo — a scientist at the Marine Biological Laboratory and chairman of the advisory committee — pointed to wide range of impacts that are already emerging in different regions of the country, including: rising sea levels, droughts, prolonged periods of high temperatures and more episodes of heavy and sustained precipitation. Miami, Norfolk, Va., and Portsmouth, N.H. were among the most vulnerable areas because of coastal erosion and flooding if the sea level rises, the scientists said. “In terms of the most concerning climate change-related impacts, near or at top of the list,” said Dr. Melillo, is “sea-level rise along the vast coastlines of the U.S.” There is an upper projection of a 4-foot sea-level rise in 21st century. —Colleen McCain Nelson contributed to this article.